A grizzly bear and her cubs in Grand Teton National Park. The Interior Department’s proposal to allow Alaskan hunters to shoot black bears in their dens may have sparked more outrage, but some major bear hunting news also came out of Wyoming last week, when a state commission decided to allow the first hunting season for grizzlies in over 40 years. 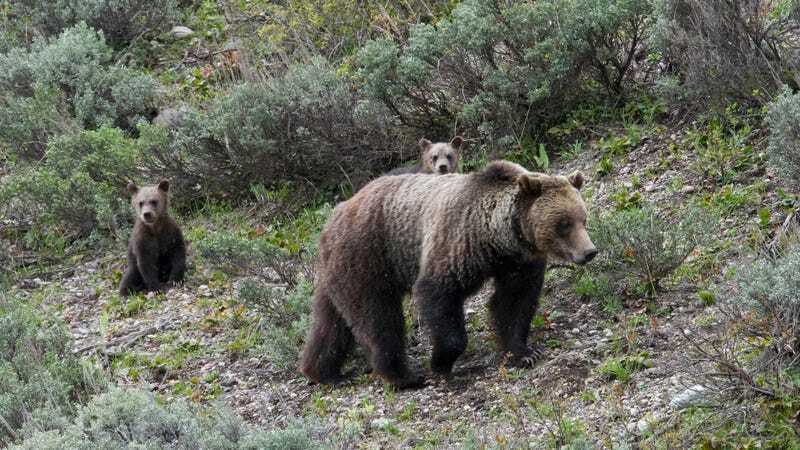 On May 23, the Wyoming Game and Fish Commission voted unanimously to permit up to 22 grizzly bears to be taken by hunters on state lands around Yellowstone National Park where the iconic predator’s population has recovered to the point that the U.S. Fish and Wildlife Service removed it from the Endangered Species List last year. It’ll be the first large-scale grizzly bear hunt in the Lower 48 since the apex predator was first placed on the endangered list in 1975—that is, if it happens. Opponents, including wildlife conservation groups, tribal nations, and many scientists, are determined to make sure it doesn’t. And the litany of arguments they’ve put forth underscore deep ideological divides with the state over conservation priorities and the relationship between humans and large carnivores. Ultimately, the issue comes down to whether the bears should be kept at arm’s length from humans, or be allowed to regain vast swaths of their former territory—including places we live. There are about 1,800 grizzly bears in the lower 48 today, including 1,000 in Montana’s Northern Continental Divide Ecosystem (which includes Glacier National Park), another 700 in Greater Yellowstone ecosystem, and three small, isolated populations in northwest Montana, northeastern Washington, and the Cascades. While the bears have been been on the rebound since receiving federal protection—the Yellowstone population numbered just over 100 in the early 1970s—today’s grizzly populations represent a shadow of the predator’s former glory. Before Anglo-Americans came on the scene and began shooting them with abandon, there were an estimated 50,000 grizzlies ranging everywhere from the Ohio River Valley to the Sierra Nevada to northern Mexico to Alaska. “Their numbers have definitely improved, but grizzlies overall still occupy less than five percent of their historic range in the West,” Noah Greenwald, endangered species director at the Center for Biological Diversity, which opposes Wyoming’s decision to open a hunting season, told Earther. Greenwald added that the five existing populations are fragmented, with physical and genetic isolation increasing the species’ vulnerability to sudden catastrophes as well as gradual environmental change. 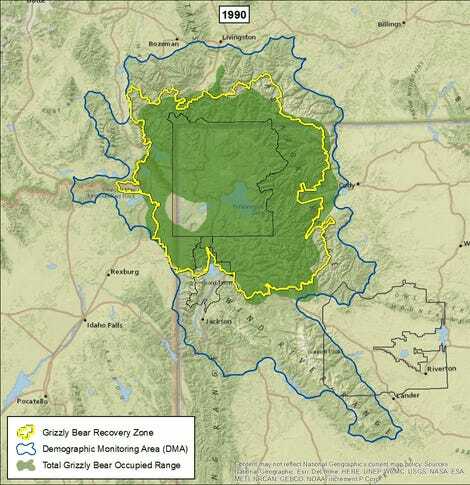 Despite these arguments, the state’s plan allows the hunt of up to 10 male bears or one female bear within Wyoming’s slice of a core “demographic monitoring area” (DMA)—a vast region encircling Yellowstone National Park that Wyoming Game and Fish Commission biologist Dan Thompson described to Earther as “an area of biologically and social suitable habitat.” Outside of the DMA, another 12 bears can be taken. It’s a different story for the other states which can now also set grizzly hunting quotas based on their fraction of the DMA. Based on its allocation Idaho has decided to move forward with the hunt of a single, male bear this fall, while Montana decided to hold off on a 2018 hunting season. With the inevitable human-bear conflicts that result in dozens of additional bear deaths a year (the AP reports that 59 Yellowstone bears were killed by humans in 2015, often following attacks on farmers’ livestock), Edge worries Wyoming’s decision to leave little margin for error could push the core grizzly population past safe limits. Indeed, the state seems to be regarding such an expansion with extreme caution. “It’s ecologically fascinating having bears in that area [outside the DMA] but it’s a recipe for disaster with the amount of people we have out there as well,” Thompson said. In his view, the state-determined hunting limits will not negatively impact the Yellowstone population. “We would not be proposing hunting if it wasn’t a sustainable action that could occur,” Thompson said. He recognized the decision as highly controversial, noting that most while public comments the state has received from Wyoming residents support hunting, the vast majority of out-of-state comments vehemently oppose it. Chelsea Batavia, a graduate student at Oregon State University who recent co-authored a paper on the ethics of trophy hunting, believes the tide of public opinion should matter at least as much as the hard numbers. Ultimately though, whether Wyoming’s hunt is allowed to proceed could hinge less on how people feel about shooting grizzlies and more on its ramifications for the entire species. FWS’s decision to de-list the Yellowstone grizzlies last year was met with a half a dozen lawsuits. In March, a U.S. District Court judge ordered all parties to combine their arguments into a single set of briefs for an August hearing, with the hope of reaching a resolution before fall hunting season begins. According to Greenwald, one of the plaintiffs’ key arguments will center around an appeals court decision last year to overturn the delisting of gray wolves in the Western Great Lakes region. In that case, the courts decided that you can de-list a distinct population segment of an endangered species, but in doing so you have to consider the impact on the listed species as a whole, something FWS had failed to do. “It’s the same with grizzlies, maybe even more so in terms of they’ve seen some recovery in Yellowstone and Glacier, but elsewhere they really haven’t,” Greenwald said.